The ice isn’t yet ready for play at the Prince Edward Curling Club this year, but the surface beyond the glass was packed Friday. 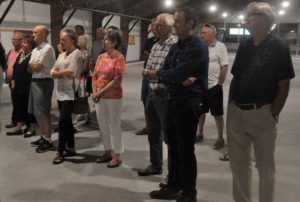 Club members paraded about on a newly poured, smooth and level concrete floor and gazed at new LED lighting, headers and pipers, side and end boards, and emergency exists. This was a day to celebrate a $100,000 project that saw the club replace its 55-year-old original floor. Officially, Ontario Trillium Foundation Quinte-Kingston-Rideau grants review team member Sharlene Weitzman and Bay of Quinte MPP Todd Smith were on hand to mark a $39,800 grant, but the event really highlighted the efforts of the club’s volunteers. President Ron Stakes said the membership came up with $38,000 in donations from within, then pushed that number to $45-50,000 through fundraising. What’s more, they also saved money by giving time and effort. Some who couldn’t physically help with the build also contributed in other way. The crews put in 9,600 square feet of installation and laid down 25,5000 feet — the equivalent of over 80 football fields — of pipe before the surface was poured. There were many people to thank. Stakes said Bob Evans, of Evans Lumber, was constantly researching better products and working with his suppliers to get the best price. One of his ideas for insulation saved $10,000, which allowed the club to replace its lighting and save 60 per cent on hydro costs. Tom Dmytar, the club’s vice-president was on site every day from April 23, working full time to see it completed. Tradespeople brought their own skills to teach others how to do the construction work. Some members even went a step further and decided to take it upon themselves to paint and refresh the lounge area as well. 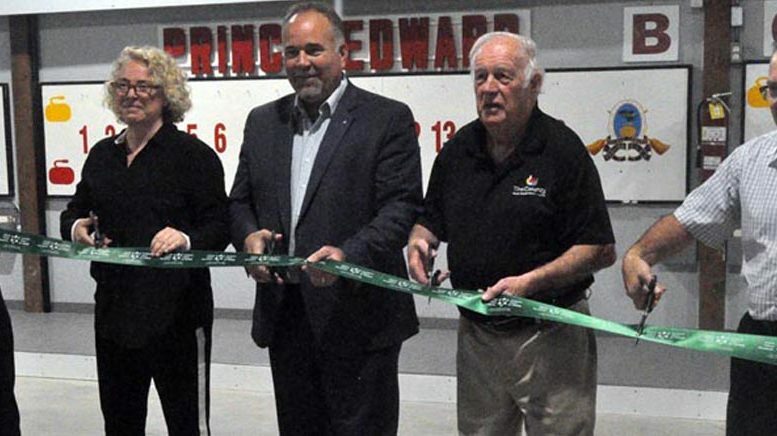 Stakes said he believes the project to upgrade the surface, “the lifeblood of any curling organization” will serve the club and the community well. Savings through energy efficiency will also go back into the club, he said, including a possible kitchen renovation in the near future. He thanked the Ontario Trillium Foundation for its support of several projects over the years. It also supported a kitchen range hood and little rocks for junior curlers to play with in the past. “Your continued support over the years has allowed us to complete a number of vital projects.” Stakes also said the John M. and Bernice Parrott Foundation made a big difference with a $15,000 grant, the Prince Edward Cattlemen’s Association kick-started the project initially, and the Wellington and Picton Rotary Clubs also donated — the latter two because of the junior programs the club has supported. Smith recognized the effort that has gone into the project to prepare for the upcoming season as he offered congratulations. Weitzman said she was pleased to be standing on the not-quite refrigerated floor to admire the fruits of the volunteers’ labour and bring congratulations. She said since 2015 the Ontario Trillium Foundation has given $2.1 million to support its “active people” investment strategy, which serves to deliver positive experiences and increase levels of physical activity including organized sport, like curling, and less structured activities. Weitzman indicated the grants review team has a vigorous process to consider potential awards. Each member of the team evaluates each grant individually, then they meet collaboratively to discuss whether grant money is appropriate. The committee unanimously supported the Prince Edward Curling Club’s latest application. “Through the years the staff and volunteers of this club have continued to work tirelessly for the good of this community,” Weitzman explained. Councillor Barry Turpin was on hand to represent the County at the ceremony. He credited the people who made the project happen within the allocated time and budget. Turpin said each successive grant helped toward the end result, but money alone seldom produces results. “That has to be put together through all the hard work of the volunteers,” he said, adding the club took over maintenance of the building from the County several years ago and they’ve done a “great job” actively working on improvements. He had high praise for their latest job, saying it might help attract events to the community.